This is a guide to help you deal with your new status of being a regular rural carrier. There will a lot of new things you will have to learn and this is just an effort to help you get a head start and learn some of the new things you will encounter as a regular rural carrier. Of course this list is not all inclusive, and should any problems arise, be sure to contact your steward. This is what I call the rural carrier “Bible-Part 1″ It has all of the things in it that you NEED to know about your job. This is Part 2 of the rural carrier “Bible”. It has very easy to understand language on the guidelines of job. READ IT, LEARN IT, KNOW IT!! The Employee and Labor Relations Manual has all of the information about your benefits, how you get paid, insurance, and more. You will have to start updating your edit book, sometimes called the red book. Every route has one, and it will become your responsibility to keep up with additions, deletions and extensions on your route. Most districts do this once per Pay Period, but there might be some that do not do them that often. Below are a couple of links on updating your edit book, but there are a couple of things I wanted to point out. 1. Once a customer moves from one of the deliveries on your route, the box does not become vacant immediately. That box stays on your edit book for 90 days before you would mark it as vacant. If your route has a high turnover rate, this can become difficult to keep up with. I use a calendar and when the customer moves, I add that address 90 days in advance. If a new customer moves in before the 90 days is up, then I just mark that box out and leave it on my edit book. If that box stays vacant for 90 days, then I can just look at the address on the calendar and mark that box vacant on that date. 2. Make sure you mark your vacant boxes as vacant. I have heard many horror stories from carriers who have been disciplined and even lost their jobs because the USPS considers a carrier getting credit for a vacant box as stealing from the USPS. If they find out a carrier is “padding” their box count, they will pursue it and it will not be a pleasant experience for the carrier. 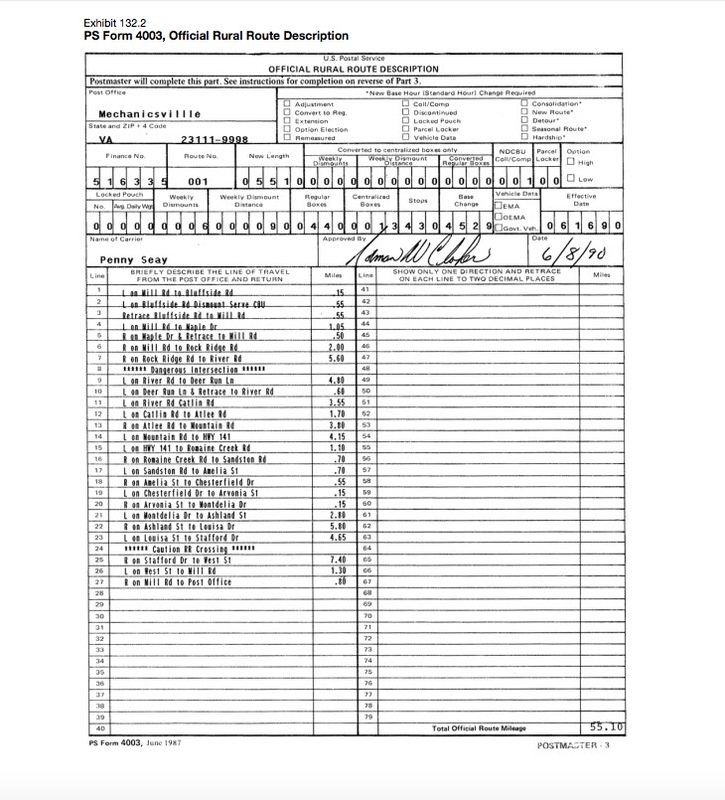 The PS Form 4003 contains all the route’s current, active delivery data including an official line of travel, current number of deliveries, miles traveled, authorized dismounts, etc… This form is used to update any changes that occur on a rural route between mail counts. The PM or supervisor must complete Form 4003 for submission to the district at the end of each pay period if there are ANY changes. The effective date for each 4003 should be the first day of the PP which will always be a Saturday. Some managers will do this automatically when you turn in your edit book, but double check that your manager has updated your 4003. If your manager updates your edit book but not your 4003, you will not get credit for any new boxes added or any other changes. Form 4003 controls your pay check. The rural carriers pay can ONLY be adjusted when Form 4003 is submitted and processed. Updating the Edit Book does NOT update any box counts on Forms 4003 nor Forms 4241-A, but edit book updates should match the 4003 updates. Once your 4003 has been updated, you should receive a PS Form 4241A, usually a couple of weeks later. This will show the current status of your route. It will show miles, boxes, salary, etc. “Bank Time” is a term used to define the time accumulated on a route as a result of adding new boxes, miles, etc. to the route. This time is accumulated each time a PS Form 4003 is submitted with new data. This accumulated time is printed on the bottom of the PS Form 4241-A until the route accumulates an additional one hour of time. At that time an interim adjustment is triggered in the route’s evaluation. The “bank” disappears each time an interim adjustment becomes effective, or when the route undergoes a mail count. Both of these forms should be kept in the route book at your case! Become familiar with them, learn them, know them!! The relief day work list at each delivery unit shall be established twice during each guarantee period. Each time the new relief day work list is established it shall supersede the previous list. All regular carriers, regardless of route classification, desiring to work their relief days shall place their names on the relief day work list. The first opportunity to sign the relief day work list will be two weeks prior to the new guarantee period. The second opportunity to sign the relief day work list will be two weeks prior to the beginning of the first full pay period in May. All regular rural carriers, not on the relief day work list, who work the relief day will receive compensation at 50% of the carrier’s daily rate of pay, in addition to receiving an X day within twelve (12) weeks as scheduled by the Employer. 1. An X day to be immediately scheduled by mutual agreement between the carrier and the Employer. The scheduled X day must be within the next twelve (12) weeks. 2. Compensation at 50% of the carrier’s daily rate of pay, in addition to receiving an X day within twelve (12) weeks as scheduled by the Employer. 3. Compensation at 150% of the carrier’s daily rate of pay. The carrier will not receive an X day. The regular rural carrier must make his or her election of the above options, no later than the day of the worked relief day. One point to add to this, I hear a lot of instances where the USPS is trying to cut down on their overtime by “discouraging” carriers from taking #3 listed above. If you have signed the RDWL, do not be intimidated. This is written in black and white! Local managers do NOT supersede a national contract! If they continue to “discourage” the use of option #3 and you know you are entitled to it, call the union and get a steward involved! In pursuance of an agreement made as a result of collective bargaining by representatives of employees certified as bona fide by the NLRB, which provides that during a specified period of fifty-two consecutive weeks the employee shall be employed not more than 2240 hours and shall be guaranteed not less than 1840 hours â€¦ and not more than 2080 hours of employment for which he shall receive compensation for all hours guaranteed or worked at rates not less than those applicable under the agreement to the work performed and for all hours in excess of the guarantee which are also in excess of the maximum workweek applicable to such employee under subsection (a) or 2080 in such period at rates not less than one and one-half times the regular rate at which he is employed. 1. Employee shall be employed on an annual basis at a guaranteed annual wage. 2. The guarantee must be a minimum of 1840 and a maximum of 2080 hours. (a) 12 hours in one day; (b) 56 hours in one week; (c) 2080 hours in one year. 4. The employee may not actually work more than 2240 hours during the 52-week guarantee period..
Every year in the spring , managers begin warning regular rural carriers whose workhours are projected to exceed 2,080 by the end of the guarantee year in November, that special measures might have to be taken. Your local management has to respond to their managers on why rural carriers in their office are projected to exceed their 2080 hours. There are many reasons their excitement may be premature. Click here for a detailed explanation. 2. There are more than 4 days of annual or sick leave plus a holiday (see Article 11) within the period. If a holiday falls on Saturday, which is a scheduled workday, absence on the preceding Friday shall be without charge to leave. If the leave period is 4 days or less, absence on Friday shall be charged to leave. 3. Interruption during the approved period of annual or sick leave by court leave due to circumstances beyond the employeeâ€™s control shall not disqualify the carrier for coverage as provided in 1. or 2. above. B. Upon request, a rural carrier shall be granted annual leave or leave without pay on Saturday, at the carrier's option, provided a leave replacement is available. When a regular carrier becomes ill or cannot finish the route while on duty, either in the office or on the route, and is unable to complete service for the day, she/he is granted sick or annual leave for the entire day. The salary payment for the trip will be made to the replacement carrier and will include equipment maintenance. The regular carrier will not be entitled to equipment maintenance while on sick/annual leave. When the regular carrier does not complete a trip due to unexpected circumstances for reasons other than personal illness or injury, she/he will be charged annual leave for the entire day. The salary payment will be made to the replacement in the same manner as above. The check stubs are sometimes hard to decipher. Check our Knowledgebase below to see a few links that might help you. You will now earn general step increases. Once you hit Step 12 you have topped out and the only increases you will receive are if there are wage increases included in a contract or you receive a Cost of living adjustment. Step progression for career rural carriers hired before 11/21/2010 will be the progression shown below. (3) A regular carrier must have a minimum of ten years from his or her retirement computation date to be eligible to elect the high option. At the time of the national count, interim adjustment, special count, or just prior to the beginning of the guarantee period the postmaster must arrange a meeting with each eligible rural carrier to discuss requirements for election of a higher classification for which the rural carrier may qualify. The commitment to use sufficient annual leave in order to qualify for a higher classification must be made in writing to give the postmaster assurance that the actual work hours will not exceed 2,080 hours during the guarantee period. The written commitment must be submitted with the appropriate forms at the time of a national count, interim adjustment, special count, or high option election. 1. An action or task that is not directly related to normal daily work functions (casing and delivering the mail). 2. An action or task that does not occur on a daily or weekly basis (If it did, theoretically, it should have been computed into the routes evaluation under Column 17 – Other Time, during a mail count.) SEE PO-603, 535.12 Column 17 Other suitable allowance: (1) A reasonable time allowance may be claimed for unusual conditions, or for other services rendered on a daily or weekly basis, that are not accounted for under normal work functions. 3. An action or task for which no time has been allotted in the rural route standards. Sick leave credited as you earn it. No leave (sick or annual) is credited to you for the first 90 days as a regular although you will be earning it. On the 91st day, both sick and annual will be available for you to use. However, if you were earning leave as an RCA when you made regular, your leave should roll over and you will not have to serve a probationary period (can use leave immediately). Leave must be used in one day increments. We have 10 paid holidays, the same as other federal employees. You must be in a pay status either the last working day before or after the holiday to receive holiday pay. If a holiday falls on a Saturday, then Friday becomes the holiday. If the holiday falls on a Sunday, then Monday becomes the holiday. If you are required to work your designated holiday, you will receive holiday pay plus the regular day’s pay (double time) except for the Christmas holiday which is double time and a half pay. You can sign up within 30 days of becoming a regular; otherwise you will have to wait until open season (generally from 2nd week in November to 2nd week in December). Coverage is available for Self Only and Self & Family. Several plans available; some union-sponsored plans require membership in the union. Pre-existing conditions are covered by all plans. Provides pre-tax dollars to covered non-reimbursed health care expenses or child care. Maximum contributions per year is $5000. (Drops to $2500 beginning in 2013). For health care, you can file for reimbursement even if not enough funds in your account. Child care account must have money in account to be reimbursed. Health care can be used to cover co-pays, deductibles, and non-covered expenses but not premiums. If you are a union member, you can find more info on the union website. The USPS FSA is different from other federal FSA, mostly on filing a claim. This is the retirement system that all new career employees are covered under. It is a 3-tier system. Minimum Retirement Age (MRA) with 30 years service. MRA is based on your year of birth. Age 60 with 20 years of service. Age 62 with 5 years of service. There are other reduced retirements available. For more information, visit www.opm.gov. 1. USPS annuity of approximately 1% per year X no. years of career service, based on your high-3 salary. 2. A special Social Security supplement until you reach age 62. Must sign up within 30 days of going regular. Different coverages available for self and family. If you have prior military service, you can use your years of service to increase your leave category. All you need is a copy of your DD-214. And you can also buy back your military time (called a deposit) to add to your total postal service time. You have 3 years to do that before interest is added, and it can be done on an allotment basis. Make sure you bookmark the National union website at NRLCA.org. You will need it and you will visit that website often. And be sure you know who your State level Union Representatives are and how to get in touch with them! Please read our disclaimer and please do not rely on this website for any grievance. A grievance can only be pursued through official channels of the union. I hope this guide has been helpful to you! And dont forget, our Rural Community is always here if you have any questions. Here is a list of helpful Ruralinfo links. Ruralinfo.net on Facebook – Our facebook page that is always hopping! Postal RHD – Looking for a route vehicle? This is the place to start your hunt! Rural Carrier Transfers - Need to do a mutual transfer? This is the place to start. Ruralinfo.net sends out a monthly rural carrier newsletter. It is filled with all of the latest and hottest news in the Rural Carrier world. Dont be left out and sign up to receive our newsletter today! Are you a news junkie that wants all the news all the time? This is the newsletter for you. Our Daily News Blast collects all the latest Postal and Rural News and sends it to you in a nice neat package every day.